Save the Date for the Melrose Run for Women! 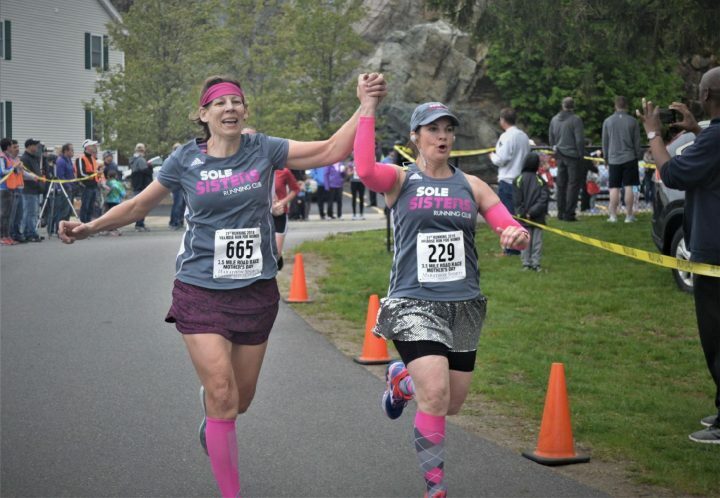 Hit the road this Mother’s Day for the 22nd Annual Melrose Run for Women! This year’s race will be held on Sunday, May 12 beginning at Pine Banks Park. The 3.5-mile road race begins at 9 am. This family-friendly event honoring mothers and children has become a Melrose Mother’s Day tradition, drawing over 1000 women. The festivities kick off with a series of kids’ races followed by the main event: a 3.5-mile run/walk which winds through the scenic and peaceful Swains Pond section of the city. Many women walk and run the course accompanied by their children. The race finishes up with children handing out flowers, music, and awards, and refreshments will be available after the race. Online registration ($28) is open until Wednesday, May 8 at northshoretiming.com. Formed in 1995, the Melrose Alliance Against Violence (MAAV) emerged in response to a study by the Melrose League of Women Voters which revealed an urgent need for battered women’s services in the City of Melrose. When Melrose Leaguers learned that there were 150 restraining orders on file with the Melrose Police Department, they decided to do something about it. A steering committee was formed to draw up bylaws for a community non-profit agency. MAAV was formed with a governing board of representatives from the police, schools, clergy, hospital, League of Women Voters and a battered women’s organization. In our first year, MAAV received a major boost from a $10,000 allocation in the state budget, sponsored by State Representative Patrick Guerriero and Senator Richard Tisei. This enabled MAAV to establish office space at One East Emerson Street. A federal grant through the Department of Justice COPS (Community Oriented Policing Services) Office partially funded a Domestic Violence Officer for the Melrose Police Department, and a Program Coordinator to staff MAAV’s office, arranging educational programs for the community and training programs for the police, clergy and healthcare professionals. 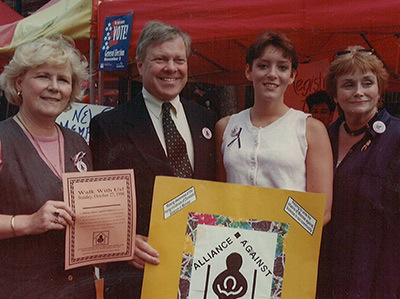 MAAV volunteers gathered hundreds of signatures on a petition of support for non-violence, and held the first Annual Walk and Candlelight Vigil on October 27, 1996 to promote awareness of the problem of domestic violence. In the ensuing years, MAAV expanded and evolved in order to address the underlying causes of domestic violence as well as helping victims connect with the resources they need. Rebecca Mooney, M.Ed., was hired as the Executive Director in 1997, and in 1998 MAAV began working closely with the Melrose Public Schools to implement prevention programs at the middle and high school levels. The Healthy Relationships Program, a comprehensive teen dating violence prevention program, was instituted at the 8th grade level. MAAV also collaborated with high school staff to launch a Peer Mediation Program in 2000, and developed a Student Advisory Board (later re-named the “Student Action Board”) that works with MAAV staff to plan and implement violence prevention programs in the schools. In 2002, MAAV’s offices moved to the 2nd floor of the Beebe Estate at 235 West Foster Street. The following year, MAAV was awarded a federal grant for youth violence prevention, addressing the issues of teen dating violence, bullying and mentoring at the middle school level. Titled the “Melrose CARES Project,” this grant enabled us to hire three part-time staff members in addition to the Executive Director. In 2007, MAAV was awarded another federal grant to expand the mentoring program to serve additional students for a longer period of time. In 2010, MAAV began offering bullying prevention training for students, staff and parents across the state in response to the need and the Massachusetts anti-bullying law. MAAV also expanded its domestic violence trainings for healthcare providers. In 2012, Melrose Public Schools in partnership with MAAV was awarded a 3-year federal STEP grant (Services, Training, Education and Policies to Reduce Teen Dating Violence, Sexual Assault and Stalking). This grant program was offered through the Office on Violence Against Women under the US Department of Justice. Melrose was one of only nine school districts across the country and the only district in New England to be awarded this grant. In 2016, MAAV was awarded the Consolidated Youth Grant through the Office on Violence Against Women to continue our work at the secondary level and expand to the elementary level. Today, MAAV has established a strong reputation as a leader in innovative programming and community collaboration both within and beyond Melrose. We have assisted the surrounding communities of Stoneham and Wakefield launch similar organizations, SAAV and WAAV. Although we have grown, the heart of our mission remains the same. MAAV is committed to breaking the cycle of domestic violence through raising awareness in the community, educating and supporting young people, and linking victims to the resources they need in order to live free from violence.